HAH. So we are throwing a party for my mum tomorrow. Happy 60th! I swear, she looks amazing for her age. Must be those Polish genes. They do say, if you want to know what you'll look like in 20 (or 37...) years, take a look at your mum! I'm a lucky gal. But anyway, in preparation for said party, I am baking her a lemon poppy seed bundt cake. Both of us have always had an affinity for lemon-y desserts. And it just so happens that the addition of poppy seeds makes for an even more oh-my-gosh-I'm-going-to-die-this-is-so-good experience. So I did some searching for the perfect recipe, and I found one...along with a friendly side note, "Don't eat this cake if you know you have a drug test coming up! If you eat poppy seeds beforehand, you might test positive for heroin use." What. WHAT?! It just so happens I DO have a drug test coming up for my new job. So how unfair is that? I have to beat this butter and this sugar and inhale this lemon and vanilla and I don't even get to taste the batter? Or the finished product? Well, good thing I really love my mom. 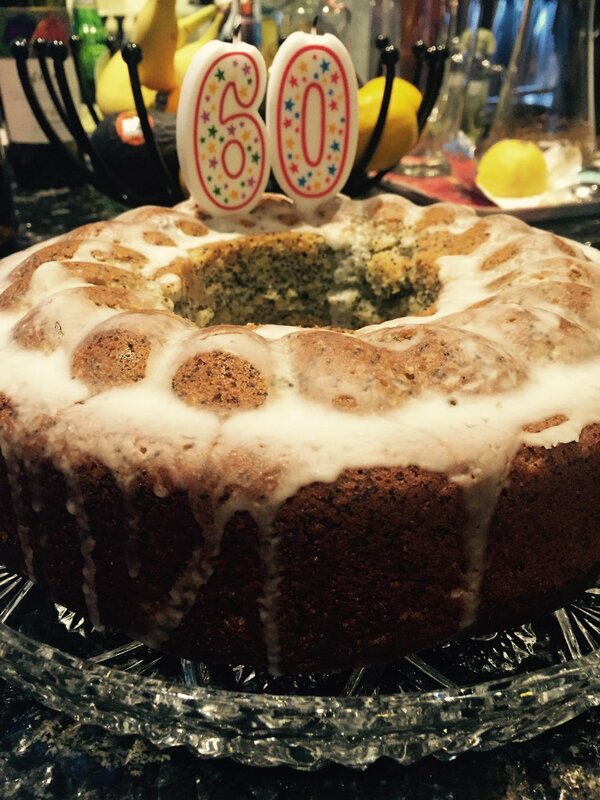 So I proceeded to make said lemon poppy seed cake. The tantalizing smells performed their amazing aromatic acrobatics around my nostrils, but I stayed strong. For the sake of the drug test, and my future employer...I must stay strong. The cake turned out beautifully. It was a real win. And sometimes, you just gotta learn to be content with good smells and beautiful sights. Taste buds, you shut up and give the glory to the nose and the eyes for once! It's not all about you! Selfish. This party, planned by my lovely father, is to be Disney Frozen themed, which, in my opinion, is absolutely fantastic. So much time to experiment with blue curacao cocktails and play the Frozen soundtrack on repeat without shame. My idea of a perfect day. So please, by all means, if you're a lemon dessert fan, I can guarantee that this cake is to die for. I am basing this completely off of the smells and visuals and the fact that I...ahem....was the baker (and my mum taste-tested it!). So, go ahead and get baking! There is something endearing about lemon and poppyseed together. Reminds me a bit of my youth, when I was obsessed with Costco's giant lemon poppyseed muffins...this is almost like going back to my childhood when I would wake up to one of those big babies for breakfast. Then I had to leave my teenage years and face the harsh reality that I can't put just anything down my pie-hole without seeing the lovely consequences jiggling around my hips. UGH, GROWING UP. So give the recipe a whirl, make your own poppy seed magic, and enjoy the moments in the kitchen and at the table. The recipe is based off of this amazing Tori Avey post! Preheat oven to 350 degrees F. Grease a nice big Bundt pan and set aside. In a small saucepan, mix together the poppy seeds, milk, and honey. Bring to a boil over medium heat, stirring occasionally. Let mixture bubble away for one minute, then remove from heat and let stand for around 20 minutes. Pour the poppy seed mixture into a bowl with the butter, vegetable oil, and sugar. Beat on high until everthing's nice and mixed, then add the egg yolks and keep beating. Add the lemon zest and juice, vanilla, and sour cream and beat until well blended. Now, gradually combine the wet and dry ingredients with the mixer, making sure you scrape the sides of the bowl and ensure everything is incorporated uniformly. Last bit (and this is the magic part, I swear!). Beat the egg whites into stiff peaks, and gently fold the egg whites into the batter. Stir gently! Now the batter goes right into the greased bundt pan, making sure you don't fill it past about 3/4 full - it might overflow. Now bake in the preheated oven for around 55-65 minutes, or until the edges are dark brown and pulling away from the sides of the pan and the cake is evenly browned along the surface. You can always do the trusty ole toothpick test here, too. Let cake cool for 10 minutes, then invert onto a wire rack (maybe put some wax paper underneath the rack, because it'll soon be time to ice the cake!). Then allow the cake to cool completely. To make your icing, just mix the powdered sugar and lemon juice to a nice consistency, not too watery. Think along the lines of the texture of thick honey. Using a spoon for assistance, generously drizzle the frosting along the cake so that it drips prettily down the sides, but doesn't cover the whole thing. Doesn't my mum look great? Happy birthday!